Take maida, wheat flour & besan in to a bowl. add 1 table spoon oil to it. Add jeera, pepper powder/chilli powder, & then add salt. make a dough of it. Keep it for 10 min. Then keep oil to heat & make very small roti of that dough like papdi. then with a fork make small holes on that roti. then fry that on sim gas. till it get crispy. 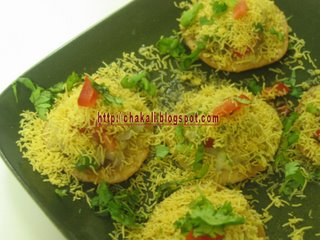 Let it get little cool & then serve it with mashed boiled patatoes green & red chatni and sev on it.